In my years as a head pro in the beautiful Sierra Nevada of Northern California, I’ve come to love mountain golf and the unique challenges it brings, including the occasional tricky par 5 that hugs the hills. Not only is the golfer dealing with sometimes extreme elevation changes, high-altitude air and distracting vistas, but there’s something about being up there among the tall peaks that makes a player want to go for it. Why not? You didn’t come all this way to lay up. Then again, sometimes leaving the Big Dog in the bag and taking on a wily, winding mountain hole is exactly what you need to do to chart a proven course to par, or even birdie. No. 12, for instance, is a nicely designed hole by Bob Cupp, a player’s designer who wants you to use every club in the bag. Ideally it’s a conservative play off the tee, and you can be a little more aggressive after that. You run out of real estate in two spots after your first shot, and on your second shot you have to hit over a ravine. The first shot, you want to be conservative — center of the fairway, 270 yards is the most you want to hit it from the back tees. I go back further than that, about 230 yards. Left and right are trouble and too far is serious trouble. You want to get into a nice landing area, a flat spot. This is mountain golf and the ball can easily end up below or above your feet. A good target is the cart path on the left. If you play from one of the “up” tees, you have a different decision to make. Our white or copper tees are the most commonly played. 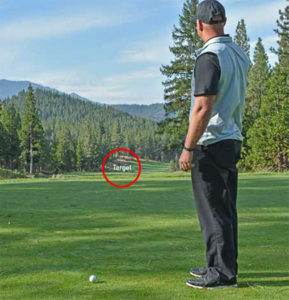 If you’re a first-time player you might not have an idea that you have about 235 yards before you run out of fairway. To the left it’s even less. Play the number that’s on your placard. Some guys think they can fly the ditch, but everything slopes right and kicks you into the hazard. So again you want to play it safe, about a 200 yard club from these tees, center of the fairway. You want to avoid left and right, where you’ll get severe lies. For my second shot I can actually hit a longer club and be more aggressive. I have a 5-wood and want to play it left-center of the fairway, since it moves left to right. I want to play the golf course and let it do the work for me. Then I’ll have a reasonable shot into the green. I’m aiming at the green box on the left, a very specific spot, which helps me focus. Now we are laying two on this long par 5, and we’re on a nice, ideal flat spot. I have about 130 yards to the pin, a good distance to put it close with a chance for birdie.